SEMENYIH (Nov 4): The government welcomes innovative concepts such as the FundMyHome scheme which provide an innovative approach to address the housing unaffordability issue in the country by enabling more homebuyers to own their first homes. Finance Minister Lim Guan Eng said that the ministry had spent some time to study the concept developed by EdgeProp Sdn Bhd in detail and found that it was workable. Under FundMyHome, the homebuyer needs only to pay 20% of the property price to own the home while the balance 80% will be contributed by participating institutions. “We still need to work out the details but this is innovative. 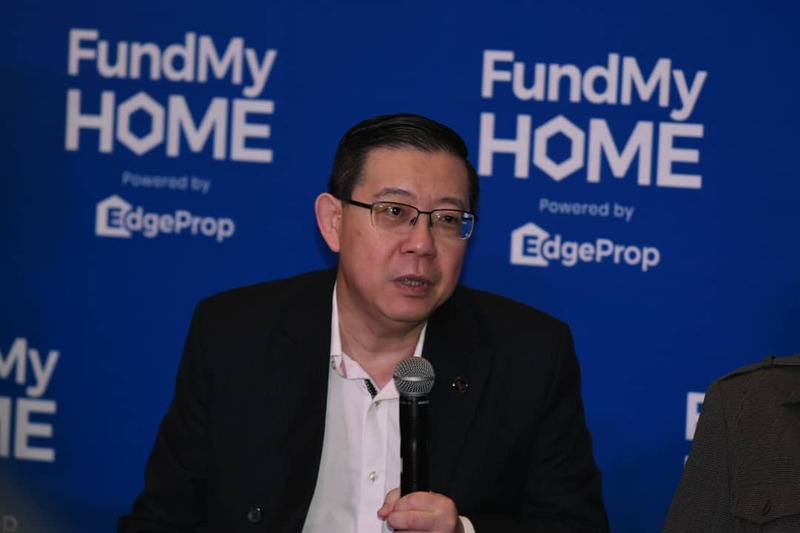 With all the safeguards in place, Malaysia can raise the bar to enable homeownership in a larger scale,” Lim told reporters at a media conference after the launch of FundMyHome officiated by Prime Minister Tun Dr Mahathir Mohamad today. Also present at the launch were Housing and Local Government Deputy Minister Datuk Raja Kamarul Bahrin Shah and Selangor Menteri Besar Amirudin Shari. Raja Kamarul said the FundMyHome platform that strives to enable more people to own their first homes proves that the Pakatan Harapan (PH) government is embracing innovations to build a new Malaysia. “The opposition leaders said yesterday that our budget is more or less the same, but it is not true. There are innovations and this (FundMyHome) is one of them. “When you want to move forward, you always have to be innovative and start something that is going to be very productive in the long run. This is the way forward for a new Malaysia” he said. He noted that FundMyHome is developed with the good intention of assisting those who could not afford to own their first homes. “We are creating innovations not for the higher income group, but making innovations to facilitate the lower and middle income group, who need help the most. We are helping those who have no money to at least to get their first home. “That is where our trust is – we take care of those who are in need and that is the difference between the previous and current government,” he said. “It may need a bit of fine-tuning here and there but no doubt, it is something that is worth trying,” he elaborated. Amirudin concurred, adding that the scheme is expected to address the end-financing issue that is being faced by homebuyers. “[This is a] very good innovation and I think it is a new initiative that can enhance the quality of buyers as they only need to pay 20% of the house price," said Amirudin. “We will support [the scheme] and we will meet Datuk Tong [Kooi Ong] to get more details about it,” he added. Tong, who is The Edge Media Group Chairman, was also present at the launch.